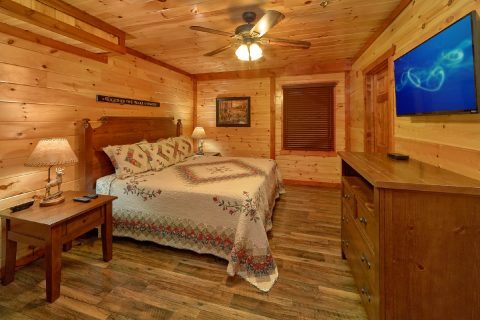 Located only 5 miles from the heart of Pigeon Forge and Dollywood Theme Park, you'll find a truly exceptional group cabin in the Smokies! 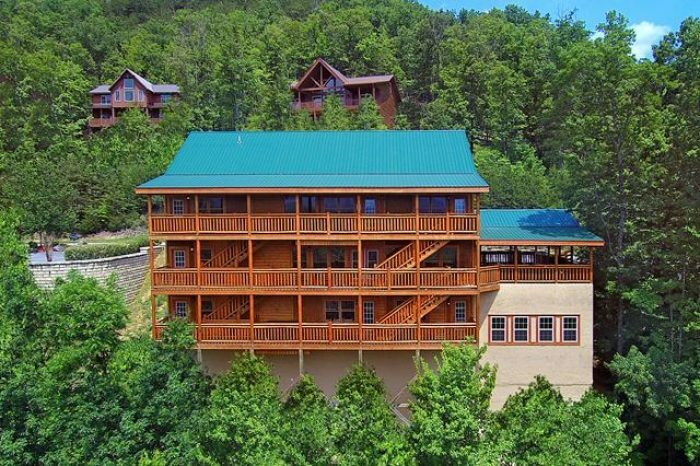 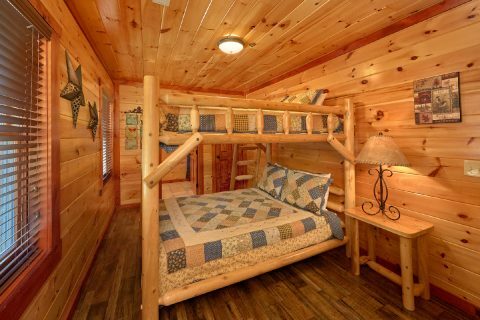 "Dream Maker Lodge" is a 12 bedroom cabin rental that sleeps up to 54 guests in comfort! 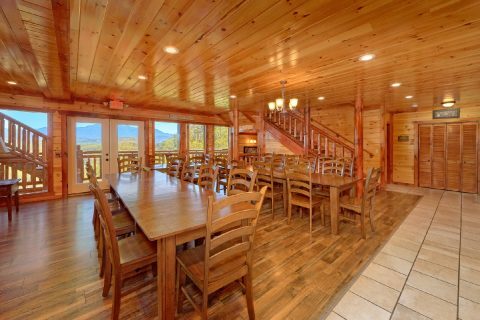 With a great location near top attractions, a gorgeous mountain view, luxury amenities, this premium group lodge is ideal for big events like a family reunion, a wedding, or a retreat. 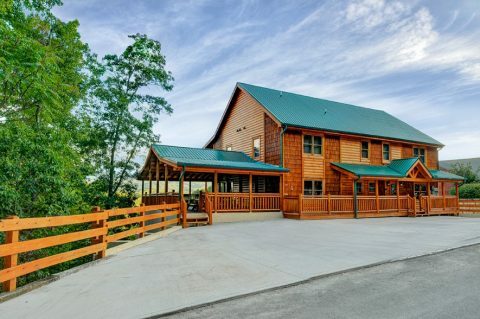 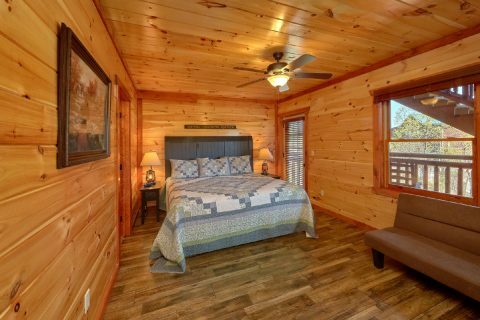 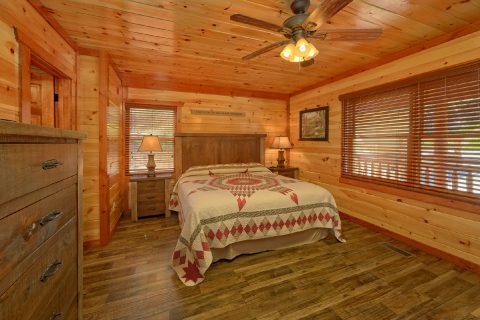 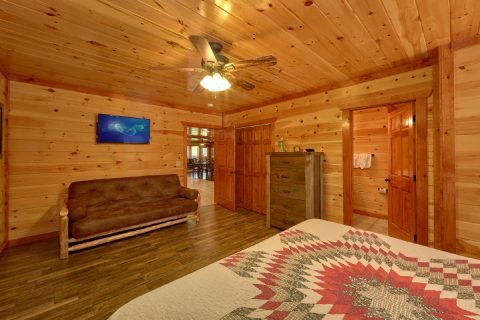 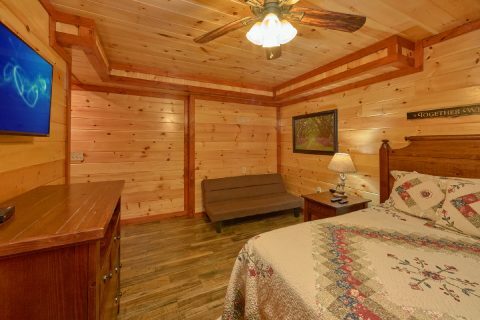 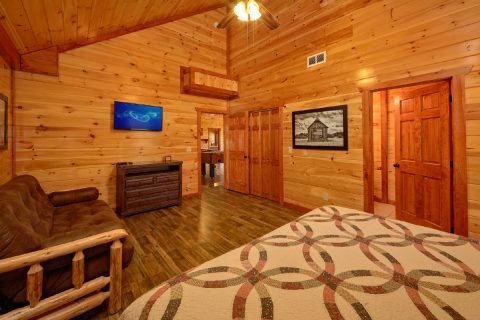 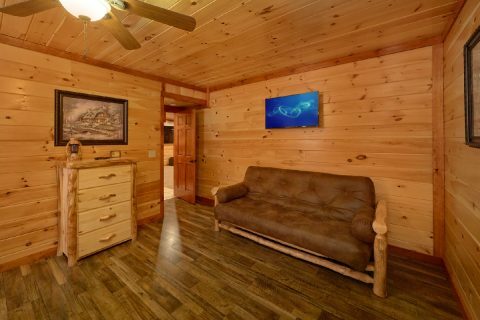 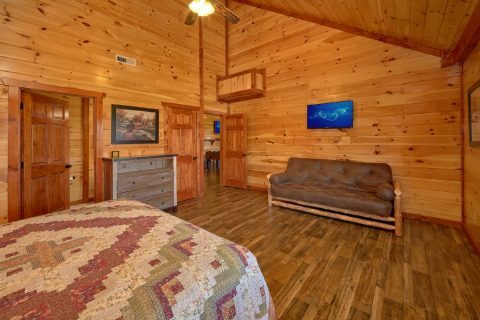 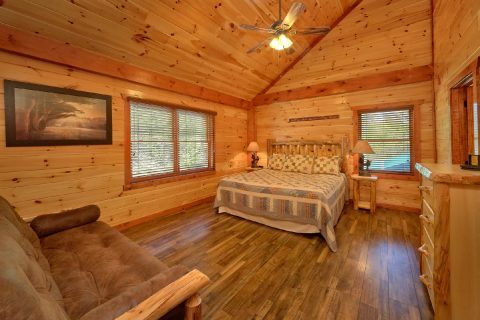 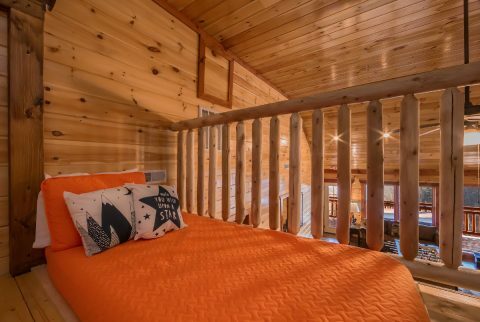 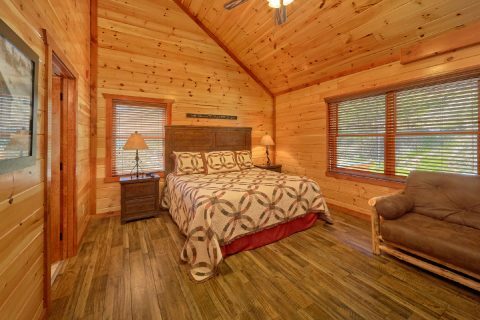 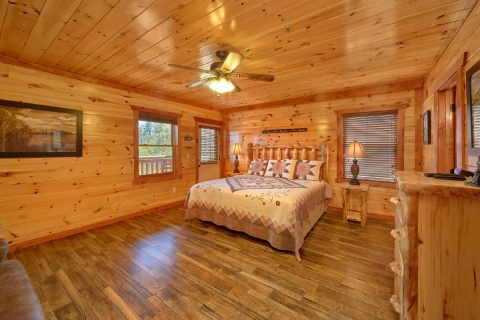 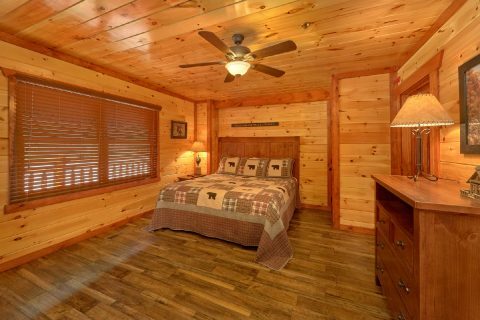 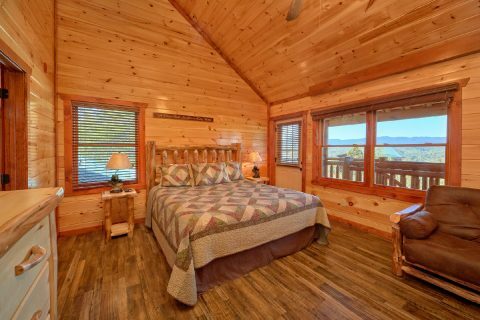 When you aren't busy riding roller coasters at Dollywood or visiting fun attractions like the Island in Pigeon Forge, you'll love unwinding at this spacious cabin rental that has plenty of room for a big group! 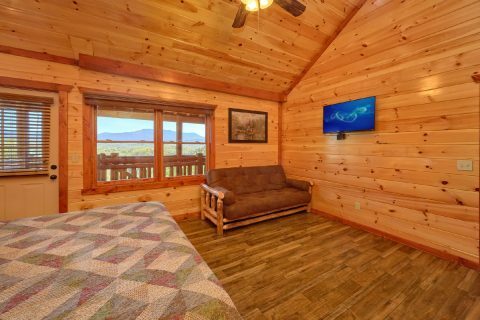 The main level of this large cabin features a living area complete with an electric fireplace, a television, large windows, and access to a covered deck with incredible mountain views. 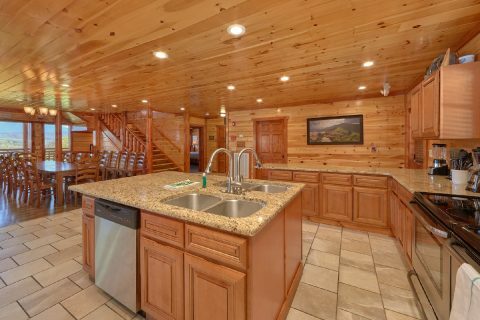 While there are plenty of great restaurant options only a short drive away in Pigeon Forge, your cabin also comes complete with a luxury kitchen and a charcoal grill for keeping your group well fed during your vacation. 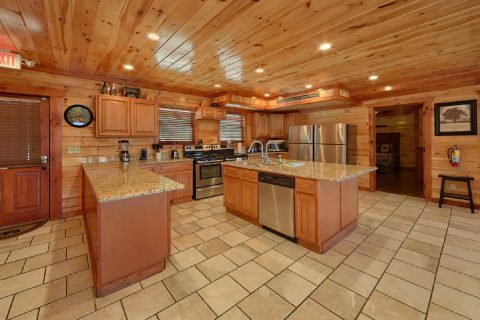 In fact, this large kitchen comes complete with two stoves, two fridges, two dishwashers, two sinks, and granite countertops for preparing delicious meals during your stay. 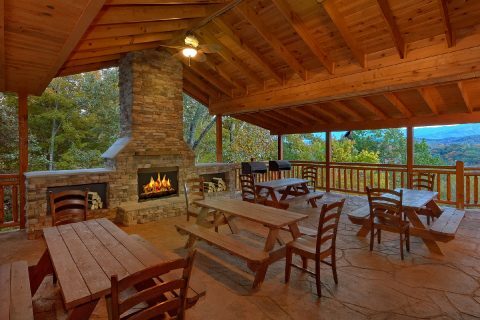 In a nearby dining area, you'll find seating for 28 guests with 3 tables and additional seating at the kitchen island. 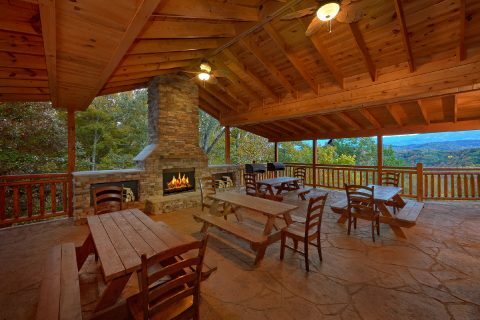 Outside on your cabin's covered pavilion, there are 4 picnic tables and 2 grills for even more dining space in the fresh mountain air. 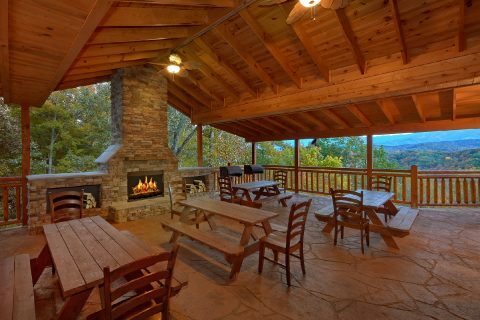 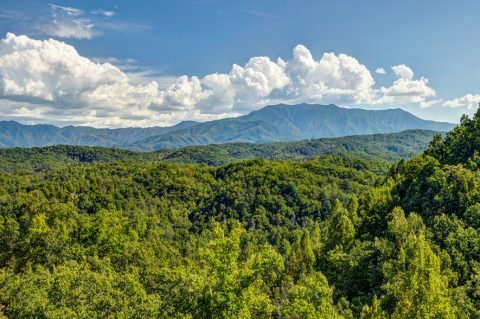 This area is also home to a large outdoor you can enjoy on a chilly evening in the Smokies. 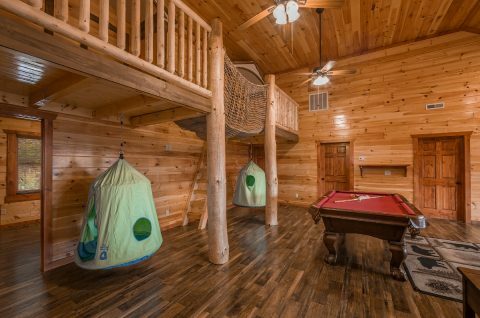 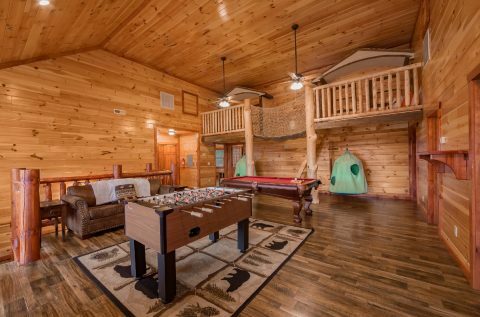 On the upper level of your cabin, you'll find an excellent game area complete with a foosball table, a pool table, and a television for relaxing with family and friends. 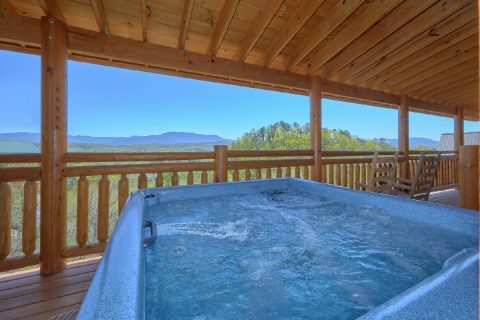 On the upper-level deck, there's a hot tub for enjoying your cabin's gorgeous mountain view while you soak in the warm water. 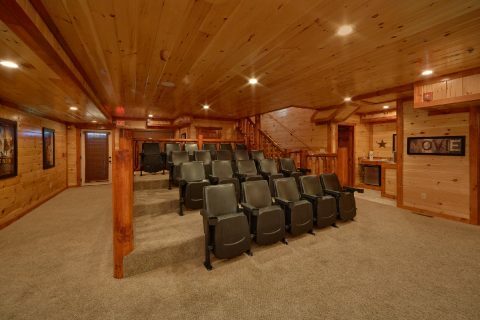 For even more entertainment, check out the theater room on the lower level that boasts a 78" screen, two mini-fridges, stadium seats, and surround sound for watching your favorite movies in style. 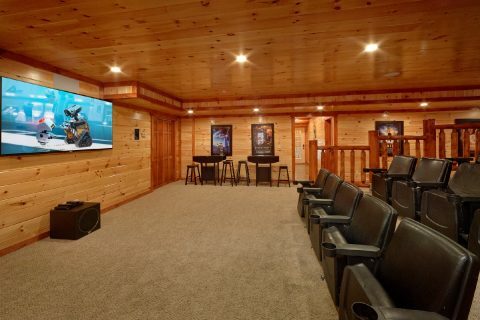 Nearby, there's a wet bar complete with a mini fridge and a microwave, so you can grab a tasty movie snack. 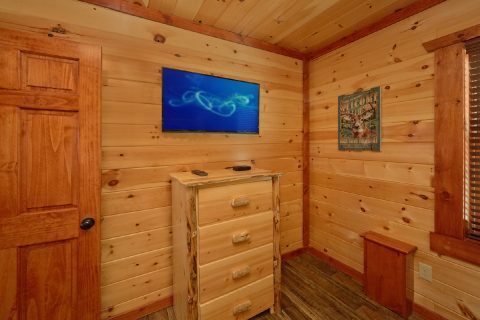 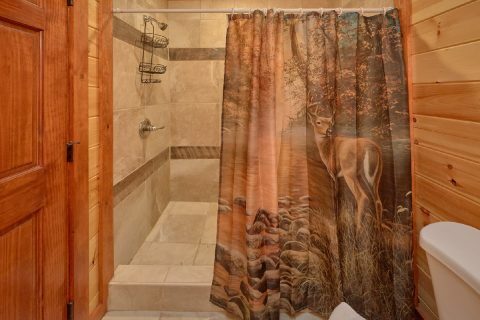 Best of all, this cabin features a private indoor swimming pool with a half bathroom on the lower level, so you can enjoy a refreshing swim any time of year! 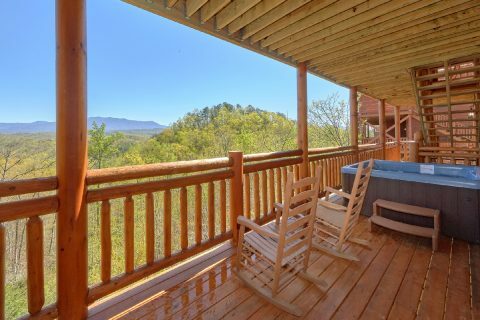 There's also a 2nd outdoor hot tub on the lower level deck for taking a relaxing dip in the great outdoors. 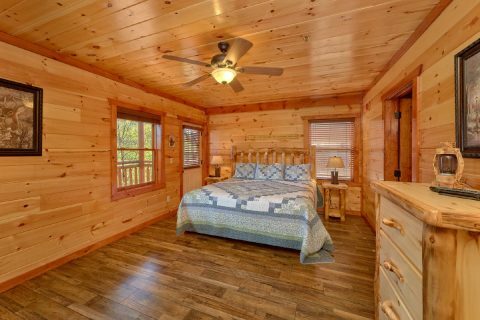 For staying well-rested on your vacation, you can look forward to sleeping in one of this cabin's 12 private bedrooms. 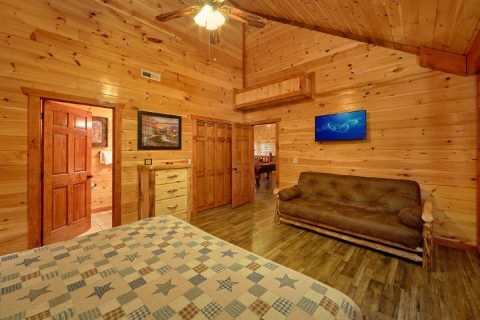 The main level is home to 3 king bedrooms, the upper floor is home to 5 bedrooms, and the lower level is home to 4 king suites with a bathroom and flat screen television. 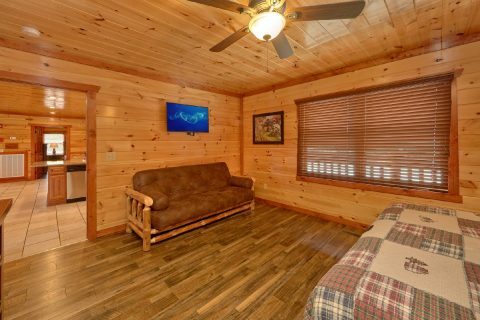 Each king-size bedroom comes with a futon for extra guests and this cabin also provides 2 living room sleeper sofas and another sleeper sofa in the game room. 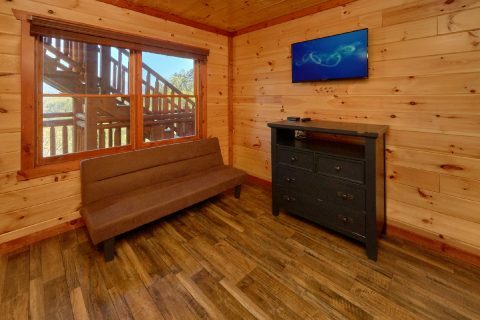 Lastly, this cabin features WiFi Internet and a washer/dryer for you to use during your stay. 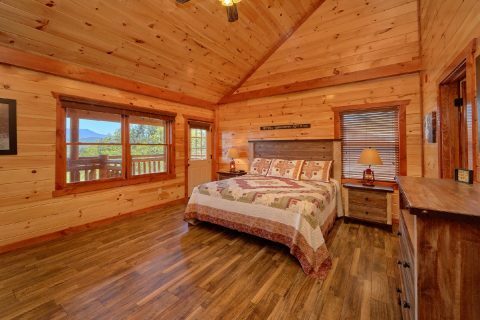 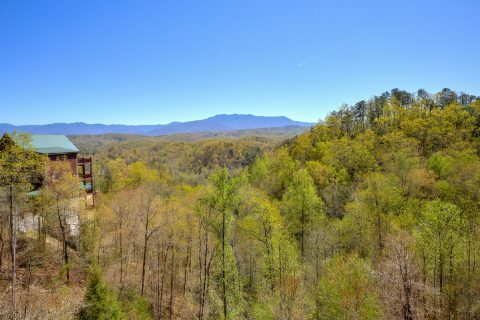 From this cabin's indoor private pool to its beautiful views of mountains inside the Great Smoky Mountains National Park, this luxury cabin is made to impress. 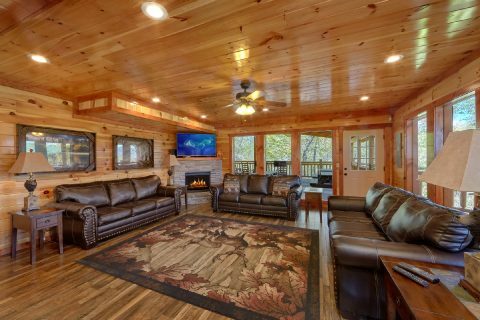 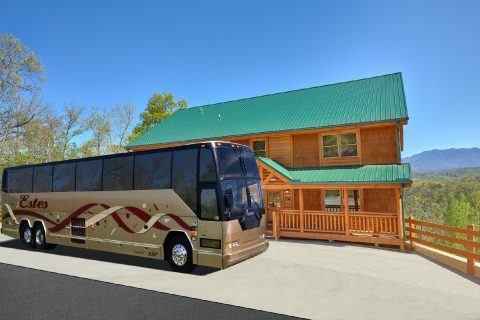 Book this group cabin near Dollywood that sleeps up to 54 guests in comfort with Cabins USA Gatlinburg to save 15% on your nightly rate!